You may or may not know it, depending on how obsessively you follow restaurant news, but longtime Lovely’s Fifty-Fifty (and prior to that, Lovely Hula Hands) chef Jimmy Albee left his heralded post last year, much to dismay of those who, like me, considered the restaurant one of the finest pizzerias in the city. The big question on my mind: Would the quality of the pizza at Lovely’s suffer in his absence? Early reports from friends and colleagues answered with a resounding YES. I’ll spare the specific invectives, but suffice it to say that my hopes for keeping Lovely’s Fifty-Fifty on the list of can’t-miss pizzerias in Portland were on life support at best, and six feet under at worst. A few months later, I started hearing a different tune on the wind. “The pizza’s good. Real good,” a friend assured me. “You’ve gotta go try it again.” Through Handsome Pizza owner Will Fain, I met a young chef named Matt Kedzie, who has been manning the oven at Lovely’s for quite a while. Matt informed me that Lovely’s Fifty-Fifty co-owner Sarah Minnick was heading up the kitchen now and that the crust had undergone a major transformation: it was now 100% naturally leavened. Specifically, Minnick was using a sourdough starter (also known as a “levain”) in place of commercial yeast. True sourdough crusts in Portland are a rarity, so I knew it was time to take the Lovely’s Fifty-Fifty Mark II plunge. What a relief, then, that the pizza actually turned out to be great. While quite different from Albee’s (both the crust and sauce have noticeably changed), Minnick’s pizza is still very much worthy of your time and money. Take the crust, the biggest step in evolution from the Lovely’s Fifty-Fifty of old. By the end of his tenure at the restaurant, Albee’s crust had evolved into an enormously puffy thing around the rim, filled with gaping caverns and tenuous strands of gluten stretching from top to bottom like stalactites and stalagmites meeting in the middle. 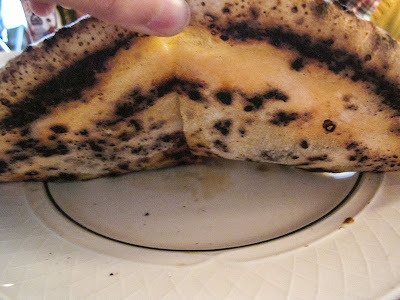 Minnick’s crust, by contrast, is far less airy, though by no means flat or dense. Break it open, hold it up to your nose, and inhale, and you’ll catch the faintly sour scent of the levain; it’s quite wonderful. Bite into it and the sourdough makes itself known without slamming your tongue with a vinegar freight train like, say, a loaf from any bakery along San Francisco’s Fisherman’s Wharf. Profoundly different from their previous crust, but just as good, for separate reasons. While the crust has increased in complexity, the tomato sauce has been simplified. The previous iteration was a blend of San Marzanos and California 6-in-1s, along with olive oil, salt, and pepper. Minnick scaled back to just the San Marzanos, olive oil, and salt, resulting in a brighter and lighter sauce overall that pairs better with the new sourdough crust. 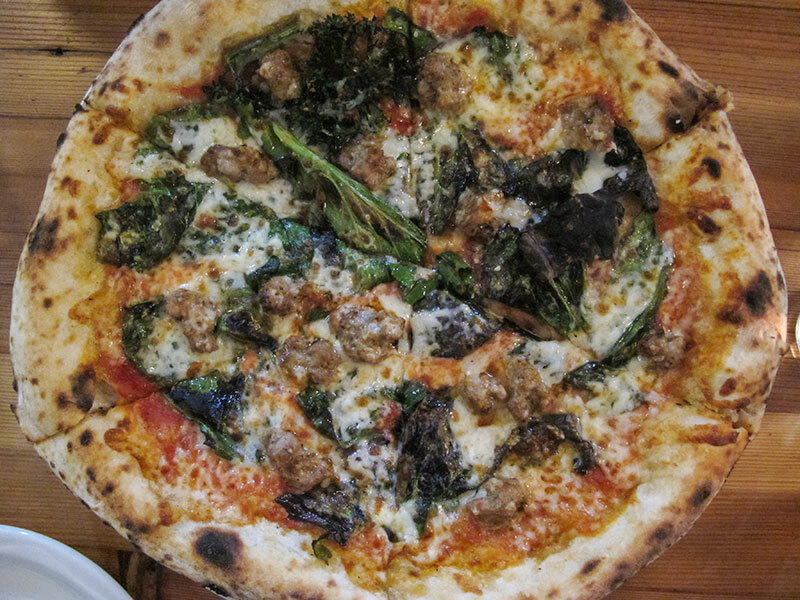 Were I a bottomless pit of cash I would have tried every pie on the new menu, but because I’m still waiting for a financial windfall I only tried the housemade fennel sausage pizza with braising greens and rosemary ($16). It was excellent. 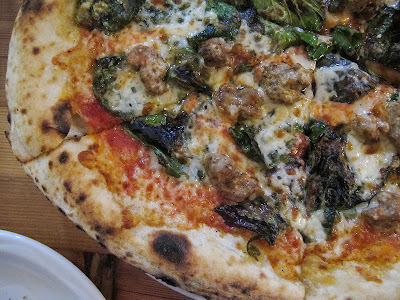 World-class sausage spiked with pepper and fennel seems to be a particular strength of Portland pizzerias (see Apizza Scholls and Kindle Kart for just two phenomenal examples), and Lovely’s Fifty-Fifty’s version maintains this high standard. I’ve had rosemary on plenty of white pies before, but never to my knowledge on a red sauce pizza, and I thought it was a splendid foil for the rich, porky hunks of sausage. The big surprise of this pie came from the braising greens, a mix of various leafy vegetables such as collard and mustard greens. Collard greens from most barbecue joints are a good comparison, as certain bites were dominated by the flavors of that classic Southern dish. Again, not a flavor I would have expected to find on a sausage pie with red sauce, but one that made me wish more pizzerias would give it a chance. Minnick’s creativity with toppings and her desire to branch out from the norm has sparked some controversy in the decision whether or not to include a Margherita on the menu. In an interview with Eater PDX last May, she stated, “We have an ongoing debate about the Margherita, and I’m so tempted to take it off the menu. It’s one of the most ordered pizzas, but I feel bad when people order two Margheritas because it’s so sad, I want them to get a different one, there are so many other delicious pizzas to get.” In the absence of Albee, the presumed dissenter here, the kitchen has gone ahead and cut the Margherita from the menu. While I fully sympathize with Minnick’s frustration toward diners who order two of the same pizza, I do wish the Margherita hadn’t been stricken from the menu entirely. The Margherita is the benchmark pizza many pizza geeks like me measure against other pizzerias’ versions, and I’m sure I’m not the only one who’ll be disappointed to see that it’s been banished here. That said, I’ll wager the kitchen will make you one if you ask nicely for it. I worried Lovely’s Fifty-Fifty would forever falter with former pizzaiolo Albee’s departure, but based on this meal, the kitchen is in very good hands. If you’ve been putting off a return visit here, or even a first visit, wait no longer. Lovely’s is great once again.